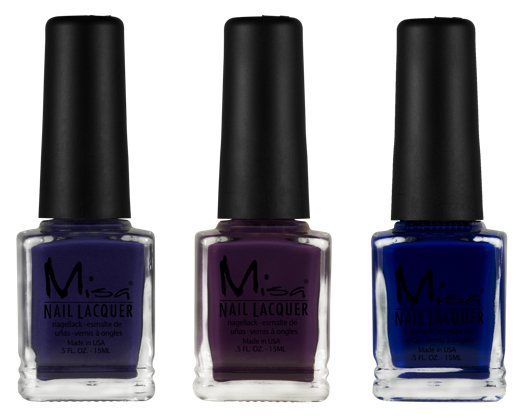 PHILADELPHIA, PA—Misa Cosmetics—the premier premium lacquer polish manufacturer—introduces its Winter 2013/2014 color collection called We’re cool. So cool. This is how cool. This collection, consisting of three striking themes in blue, is cool, classic and enduring; familiar yet unexpected. Misa color mavens Ann and Lynn Tran said “We’ve always had this yearning to create a blue-only themed winter collection and now was the perfect time.” These particular blues, they said, remind them of all the most beautiful parts of winter: frosty mornings, walks in the woods, a midnight ride home after a holiday get-together. Winter Bluesy Blues, a seriously serious deep and decadent blue pretty enough to remind us that every day is a holiday. Each "We’re cool. So cool. This is how cool." lacquer polish is $7.50, U.S. To order, visit www.misacosmetics.com or call 888-733-6472 or 610-461-3616. Headquartered just outside Philadelphia, Misa’s line of polish and gel lacquers has earned huge popularity internationally and is now beginning distribution domestically. The company is run by the next generation, brother-sister team Ann and Lan. What they’ve brought is a true lifelong understand of their business, a love of color, a respect for the tech and how their business impacts the world. For example, they realized that the love they felt for the family Malteses should extend to all creatures; hence all Misa Cosmetics are made without animal products or testing. !